There is a new lifestyle trend on the rise, and it is changing the way influencers interact with their audiences. ‘Cleanfluncers’, as they are known, are people who showcase their cleaning tips and dazzling homes online. Netflix’s new programme ‘Tidying Up with Marie Kondo’ comes in the midst of a revamping of lifestyle influencers. People are turning away from the flash, expensive lives of ‘traditional’ influencers and looking to imitate others with showcase-like homes. To many, watching another person clean their home sounds as dull as watching the washing machine go round. However, influencers such Marie Kondo, Sophie Hinchcliffe (Mrs Hinch) and countless other Instagram and YouTube stars attract the attention of millions of followers. Their advice ranges from home organisation to removing stubborn stains. We live in an age when minimalism seems unachievable for many. Brands and the high street pull us into buying more and more stuff to fill our homes and wardrobes in. Kondo’s philosophy is less is more – every item you own should have a purpose and ‘spark joy’. A new wave of decluttering has ensued, and charity shops have reported a spiked increase in donations as a direct result of the Netflix hit. However, the impact of ‘Cleanfluncers’ is nothing new. Channel 4’s ‘How Clean is your House?’ ran from 2003 to 2009 with Kim and Aggie presenting six series. Reality TV centred on home and personal improvement proved as popular 10 years ago as it does today. The show’s success, and that of current cleaning influencers, lies in the satisfaction of transforming spaces. Clean spaces have long been linked to mental well-being. Dr Nicole R. Keith conducted a study which found that those who live in tidy spaces are healthier. Although the study focused on physical health, many have found home organisation to benefit their mental health. 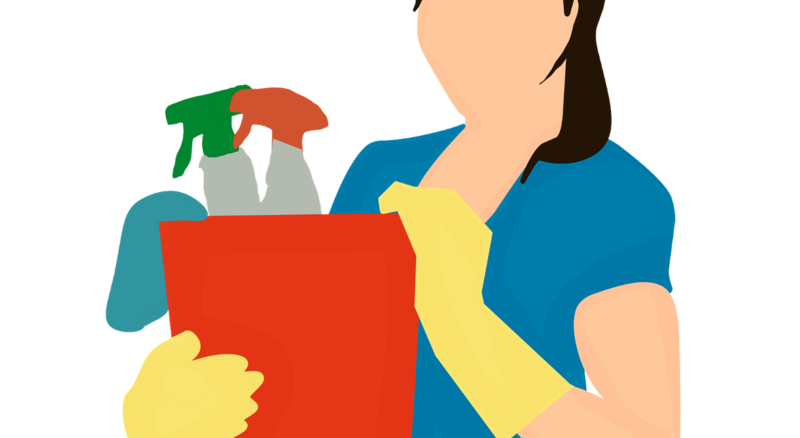 Mrs Hinch talks openly about her struggle with anxiety and how cleaning helps her. Her candid honesty is refreshing on a social media site such as Instagram. It takes away the pressure many feel to live a perfect life. For many, the process of cleaning is a way of restoring order. Some critics of cleaning influencers argue that they reinforce gender roles. The top names in the business are all women, and 90% of their audiences are female, too. However, there appears to be an awareness of this imbalance by Instagram cleaning stars. Mrs Hinch frequently shows her husband, James, pitching in on the home chores. Occasionally, he will take over her Instagram story and show us how to properly clean a sink. Furthermore, the success of online cleaning gurus has opened up opportunities of fame and fortune for those heading the lifestyle trend. Mrs Hinch and Lynsey Crombie (The Queen of Clean) have both written books sharing their experiences. Product promotion, sponsored posts and cleaning product ranges work as sources of income for the influencers. One of the most appealing aspects of this kind of lifestyle is that it is attainable. Influencers, and the sites they operate on, are frequently criticised for promoting unrealistic goals and everyday. Yet, to participate in the cleaning craze, all you need is a space and a few affordable items and tools. This attraction comes as a backlash against the filtered unreality and expense of the average lifestyle blogger. Videos and tips by cleaning influencers are informal, chatty and offer practical advice rather than wistful dreaming. The authentic depiction of every day life is a world apart from the highly edited realities we are used to seeing. As a reflection on our material lives, cleaning influencers provide guidance on how to declutter the home and mind. So, whether you recoil at the thought of watching others clean, or if it inspires you to tackle that bedroom cupboard, ‘cleanfluencers’, it appears, are here to stay.